Krysia Tripp received an M.M. in Performance from the Cincinnati Conservatory of Music and studied with Thomas Nyfenger at Yale. In addition, she has studied with Leone Buyse, Robert Willoughby, Jack Wellbaum, and Julius Baker. She has concertized in the U.S. and Europe, and has had the opportunity to collaborate with a diverse group of artists including Luciano Pavarotti; Peter, Paul and Mary; the Brubeck Brothers, and Andrea Bocelli. Krysia currently performs with the Southwest Florida Symphony, the Hartford Symphony, Rhode Island Philharmonic, Portland Symphony, Indian Hill Orchestra, and the Sigmund Romberg Pops Touring Orchestra. In addition, she has participated in the Spoleto Festival (USA and Italy), the Aspen Music Festival, Norfolk Chamber Music Festival, Sarasota Music Festival, Bear Valley Festival (CA) and the New Hampshire Music Festival. Recent Concert series include Chamber Music the American Academy of Arts and Sciences, The Art- Complex Museum, and Yale Center for British Art. Krysia is a member of the Artist Faculty at University of Southern Maine, Bates and Bowdoin Colleges. 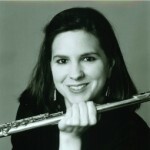 Former students have won top prizes in prominent music competitions including the National Flute Association’s Young Artist Competition, and the Fischoff Chamber Music Competition. Her students have also been selected to perform in NPR’s From the Top with Christopher O’Riley.